Although Google is a powerful tool to search the Web or News groups but there are many alternatives. It really all depends on what your looking for. An interesting alternative is to use a multiple search engine so that one request produces results from a dozen or more different systems which reference data in different ways and therefore come up with a wider range of results. An example of this is Search"> which is well worth a try. For another example, which is particularly useful for finding the answer to encyclopedia type questions e.g. why is the grass green, why not . Another popular multiple search engine is MetaCrawler which is very quick and wide ranging. I often use Dogpile which, despite its unattractive name, usually finds me the link I want. Or you can be cutting edge and try Blinkx which is apparently the way all search engines will go! If you want to do some "useful" searching, why not try SETI, the Search for Extra Terrestial Intelligence, American for Little Green Men. Join half a million others around the globe and, if you are the first to detect alien life, you'll be famous (don't forget to mention where you heard of it of course!). And if you want to take a more active part in space exploration, then go to Galaxy Zoo and have fun picking out the galaxies and what kind they are - you have to pass the test first of course! As my wife is Jamaican by birth, we have an on-going interest in the country. When we visited Montego Bay a few years ago, I noticed this amusing sign (unless you are a bottle or a radio) at the entrance to Doctor's Cave Beach. For all you would probably ever want to know, the Jamaica Web Site is the place to go! By coincidence, the HTML editor I use to prepare these pages is called (and very good it is too) which is the name of a spider found in Jamaica allegedly endowed with a wealth of knowledge and advice, an arachnid Confucius. One of the pleasures of surfing the Web is the strange and sometime funny things you come across, particularly from America. Some random finds include the Dilbert page, although that didn't take too much effort. Since I used to work in a similar environment to Dilbert, I found the stories alarmingly close to reality. We seemed to have all the characters and situations he describes although, happily, I' was not among them! Less easy to track down was a page entitled Who have they hacked now which shows before and after pictures of well known Web sites which have received the attentions of some ill-intentioned persons. Clever stuff, I suppose. Odder is the Politically Correct page, especially if you have the sound turned on! Another collection of strange facts on a variety of subjects can be found at the Web-Odditorium! On a totally different tack, what about this Fox Scarer device? If you find it does work, please let me know because I'm fed up with them messing up my garden! And then there's the famous Cambridge Coffee Pot complete with its history! As a resident of Bromley, I tracked down some daft place names by its reference to the unfortunate Pratts Bottom, on the south east edge of the Borough. Of course, if your taste in humour lies in a different direction, you may wish to explore some of the odder sites on the Web - and you should have no difficulty finding them! To get you started, why not find out how to make an atom bomb and other useful devices. Or, if your personal safety is worrying you, then try Stop Alien Abductions for advice and guidance! This site was located by a colleague from work - I am still wondering what he was actually looking for. If you want to find someone's E-mail address, it is generally considered best to give them a call and ask! If you don't even know their number, you could try Directory Enquiries on-line, which can be a bit cheaper than calling the "human" service! However, that isn't always possible and there are other ways. Although the big service providers, like Compuserve, keep lists of their own members, if you aren't one of them this isn't much help. One alternative is to try Yahoo People Search but you may still not be sure if you've found the right John Smith! By the way, don't forget to add yourself to the list! However, if you want to get really serious about tracking down a potential contact, you probably need to have a look at E-mail resources which should keep you busy for a while! The other problem is that people change access providers and the E-mail address they have given you may no longer be valid. One way round this is to add your name to a forwarding service which simply points to your current Internet Service Provider. A FREE provider of this facility is the oddly named Bigfoot. I have added myself to the list so a mail to me should get through anytime. Please give it a try, I'd like to hear from you! The Open University, from which I graduated in 1985, took on its first students in January 1971 (unusually, the academic year runs from January to October - on most courses you get Christmas off as a special treat) and operates almost entirely by postal, radio and television learning (often at unsociable hours of the night). Increasingly, it uses tapes, videos and computer forums as well to keep in touch with students. Many courses have a short summer school, usually held at a conventional university whose "full-time" students are having the summer off, so that you can experience for yourself the pleasures of having all your worldly needs taken care of while you immerse yourself in learning - it can be quite addictive! At the end of a degree course you can attend a graduation ceremony and look like this (Click on the picture for a larger image). The baggy trousers aren't compulsory. Having completed her professional examinations, my wife then studied with the OU to gain an MBA. Like myself, she didn't have the opportunity for university level education when she left school. Of course you don't have to study for a degree or other qualification, most courses are available for mature students just to enhance their knowledge of the world. If you want to know more, press the to find out. 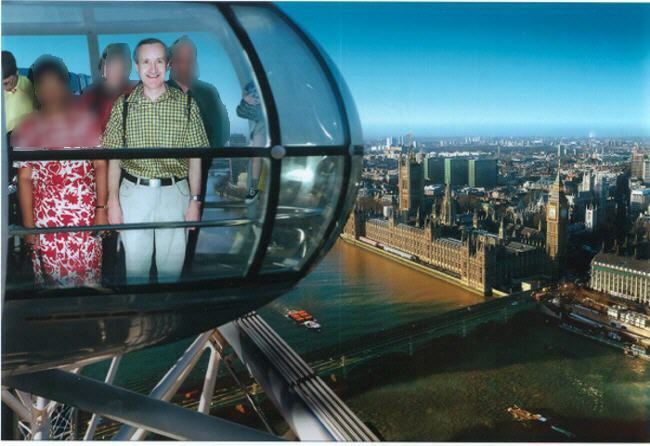 I recently completed a "flight" on the London Eye, or Millennium Wheel. It was a strangely uneventful affair, the motion being so slight that only by looking across the axle of the wheel could you detect the movement. You need really clear weather to get the best view, but even on an average bleak English summer day (actually it wasn't bad!) you can pick out lots of interesting sites, particularly if you know London well. I thought it was �8 well spent and will probably go again some time. The picture is a fake, however: we had a group photo taken before take-off (to identify survivors?) and this is pasted on to a standard view of the Thames and the Houses of Parliament. Quite a neat idea really. I have tweaked the photo to preserve my companions' modesty, it wasn' the pod steaming up! This trip contrasted very widely with our visit a few years ago to the Blackpool Pleaseure Beach and our ride on the Pepsi Max "Big One" roller coaster . Although there appears to be some dispute among aficionados of these constructions, it would seem that at 214 feet high (65m), a maximum speed of around 80 m.p.h. (128 k.p.h) and a 65º slope, it ranks in the top two or three in the world, for terror that is! The reason I mention this aspect particularly is that, having experienced it first hand, I can confidently state I shall not be repeating the experience. Nor am I showing you a picture of me screaming with fear as I plunged over the top! However, if you like being scared out of your wits, read all about The Big One and all the other fun of the fair here. Whilst this cannot really be described as an interest, as a sufferer from athlete's foot for over 30 years (quite unfairly as I can't run for toffee), it has been a concern. Happily no more. After endless application of powders, creams and ointments, the problem has been cured, by shampoo! I don't know who the author was, but I was showen a newspaper cutting which recommended soaking your feet in anti-dandruff shampoo. I have to confess I was pretty sceptical but was eventually driven to try it. After a minute a day soak for less than a week, my skin healed up and the problem vanished. If you are a sufferer, then I would suggest you give it a try. There is no charge for this tip and no link unless you have other health concerns in which case you could try which also offers links to a very wide range of reference information. If you like to depress yourself over all the things you might catch, then you need to know about emerging diseases! Finally, the cure for the common cold? Well, not quite, but I do find a daily zinc tablet as soon as you feel the symptoms coming on make the whole thing a bit more bearable. Worth trying anyway!